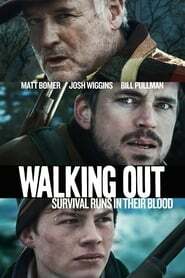 Based on the masterpiece, American short story, Walking Out, David (Josh Wiggins), an urban teenager’s journey to rural Montana to go hunt big game with his estranged, ‘off the grid’ father, Cal (Matt Bomer). As they ascend deep into the wilderness, father and son struggle to connect on any level. A brutal encountering leaves them both with serious injuries in order to survive. survive.